Need help with your outdoor kitchen design & build? Thinking of hiring an exterior design build firm to create your dream outdoor living area? 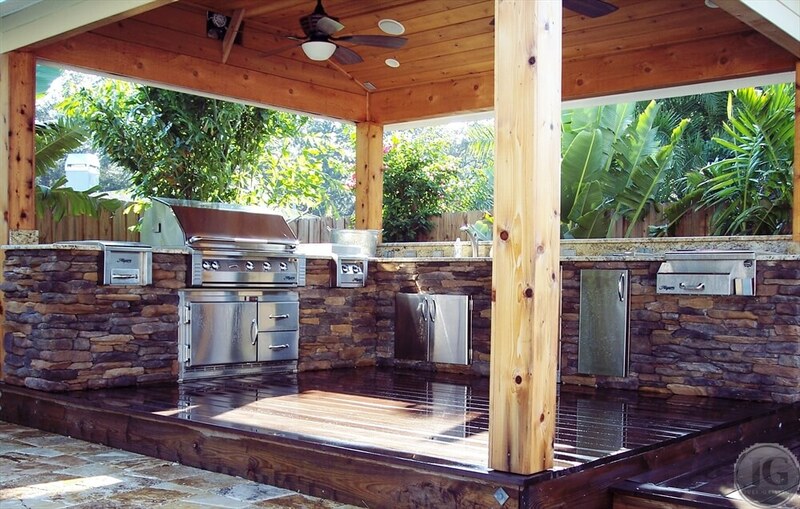 From full outdoor kitchen redesigns to repairs of existing outdoor kitchens areas to creating a luxury patio oasis with a fire pit, let the outdoor living experts at Just Grillin Florida help you design and build your outdoor kitchen & backyard entertainment area! If your house, one of the largest purchases you will ever make, was built by a licensed contractor, should your outdoor living area, which is a reflection of your house, also be built by a licensed contractor? At Just Grillin, we specialize in outdoor living and we are experts at it. Designed to create the experience of luxury outdoor living, Just Grillin’s 2,500 sq. ft. Retail Store includes an Exterior Design Build studio, several fully constructed outdoor kitchen displays, and is stocked with all the specialty grilling products you could need: sauces, salsas, mustards, baking mixes, rubs, spices, brines & marinades, charcoal, electric, gas, ceramic kamado, infrared, & wood pellet grills, BBQ smokers, pizza ovens, fire places, gas logs, fire pits, gas heaters, lamps & torches, ventilation hoods, refrigeration, warming drawers, outdoor TV’s & furniture, grill accessories, flavored wood chips, chunks, planks, staves, & pellets, Himalayan salt plates, 100% natural lump charcoal, cookbooks, décor, gift baskets, and so much more! Please contact Just Grillin today and experience why we are “Tampa Bay’s Premier Outdoor Living Company”.